Lemon Frost Thyme really lives up to its name. A rapid grower with wonderful lemon scent, it is perfect for covering large segments of ground. In the pictures below you see how one customer took Lemon Frost to a whole new level. She worked on this over a three year period. 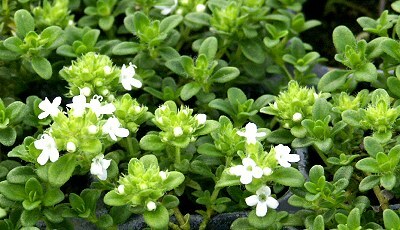 Other lemon scented ground cover thymes include the variegated varieties Doone Valley Thyme, and Goldstream Thyme, and the dark green Pink Lemonade Thyme. These three bloom pink. Lemon Frost is often included in our 36 Pack Alternative Lawn Assortments. This plant is often available in plug trays. These trays hold 128 of all the same plant. They are a great low cost way to fill a lot of space. Each cell is 3/4 of inch by an inch. Check here to see if Lemon Frost Thyme Plug Trays are available.